If you’ve been anticipating Lil Wayne’s upcoming album, Tha Carter V, it seems that you’ll still be waiting, according to the rapper. The New Orleans artist and CEO of Young Money Records has taken to Twitter to blast Cash Money Records, the label that has been his home since he was 11-years-old. In a series of tweets, Weezy F. sternly criticizes the House of Bryan “Baby” and Ronald “Slim” Williams—likening his contract to a prison sentence. While Cash Money Records nor the Williams respond to comments, Young Money artist Tyga called Wayne a “legend” for taking the label to task over the delaying of his album. 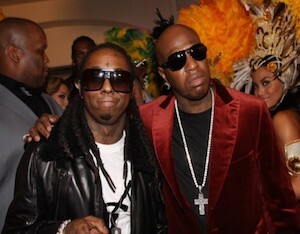 Back in March, MTV reported that Tha Carter V, which Wayne has called his “final solo album,” would come out that May. In lieu of the album’s release, he put out “Grindin’,” a track which featured his Young Money superstar artist Drake. Wayne and Drake then embarked on a co-headlining summer tour while the album still remained unreleased. In August, Wayne then dropped a behind-the-scenes and official video for another new song, “Krazy,” with the album expected to come out to the masses in late October.